I did get a chance to speak directly with Ranger Nelson regarding the need for greater enforcement on OHV non complience in the Juniper Flats area. BLM law enforcement funds are limited and a greater priority is given to catching moblie meth labs that are operating out in the mojave desert. The desert area has historicly been a dumping ground for murder victims and frankly, I aggree with Ranger Nelson that this kind of criminal activity takes priority over some bonehead chewing up the desert. Local residents and concerned idividuals have petitioned the BLM to create a seperate planning area in the Juniper Sub Region independent of the WEMO planning. This area is a transition zone between the USFS lands and the Mojave desert. Its close proximity to a large urban interface combined with a high fire danger due to invasive weed proliferation,multiple private property owners facing non complient OHV activity from BLM lands, steep erosive terrain and a lack of funding for law enforcement give reason to this idea. 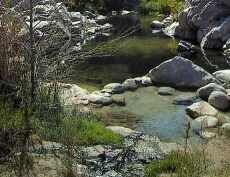 The riparian areas are critical habitat for wildlife and some species are highly threatened by the onslaught of OHV activity. The WEMO plan is an effort to provide route designation for public access and recreation while protecting and conserving our national resources. After reviewing the multiple and redundant proposed open routes, it became obvious that the OHV industry was heavily influencing the WEMO decision making process. Many different concerned individuals from various other intrests felt shut out of the public WEMO decision making process and have petitioned the BLM to create this seperate planning area for the Juniper Sub Region to properly address the multiple and complex issues facing this area in a rational way based on scientific evidence and research. The Juniper sub region has long been recognized by the BLM as having unique and special resource values. It has been designated Limited Multiple Use for decades and the rush job WEMO route designation did not meet this classification. Since the worlds largest OHV open area exists 20 miles away at Johnston Valley, it makes sence to encourage OHV recreationalists who wish play to go there. OHV oppertunities with connectivity to the USFS OHV network already exist in the Juniper Sub Region. The problem is with OHV users who cant seem to obey the laws. This is why we are calling for a greater enforcement presence. I hope this clarifies the rumor that Moose heard with some real facts. I would be happy to answer any questions on this to the best of my ability since there is no hidden adgenda here, just the bear facts. Thanks to Rick for providing this site for all to communicate in a respectful way.